Back in the Dark Ages when I started writing, my first mystery editor was fond of praising books as “ripped from the headlines.” Like most mystery novelists, I pillaged local crime stories, and for a time I made a good thing out of the London Daily Telegraph’s stellar coverage of chicanery and mayhem of all types. 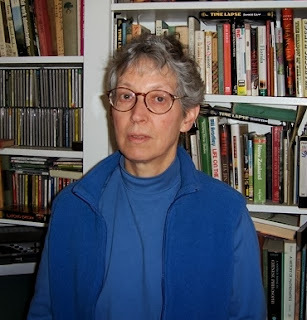 But for some perverse reason, I was more often drawn to the back page stories, and when I did get inspired by a sensational crime, I was moved to alter the situation almost unrecognizably. Clearly, I wasn’t ready for the big time. However, I’ve had a more complicated relationship with earlier, “ripped from the history books” crimes and real life historical characters. I’ve done three straight novels based on historical fact, only one of which, All the King’s Ladies, set at the Versailles court of Louis XIV, was a success. It was detailed and historically accurate but it filtered much of the action through minor characters. With these less than stellar results, a smart writer would clearly have steered clear of real folks, even if they were safely dead. However, a certain persistence being a requirement for any writer, I was recently tempted back to the history books, or at least, to the memoirs, to write a trilogy of mystery novels using Francis Bacon. Not the Renaissance Francis Bacon of political and scientific influence but the 20th century Anglo-Irish painter. Gay, promiscuous, alcoholic, and a genius, Bacon was out of my usual range and, believe me, I spent quite a bit of time considering whether he was really a good idea. Then I learned he had lived with his old nanny until her death, and the game was on. As a downstairs child on an upstairs downstairs estate, I knew Nan, at least. 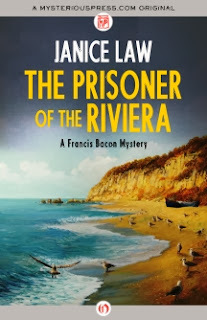 The result was Fires of London – Francis during the Blitz - and the new Prisoner of the Riviera – Francis on a French holiday that goes bad, with a concluding volume forthcoming. These novels have written a good deal easier than my earlier ventures into historical fiction, and I think I know why: I’ve hit the right balance between historical accuracy and the imaginative freedom required by the novel. This is easier said than done, especially if, like me, one has also written history books and historical articles. All too often I’d hear a little nagging voice in my ear saying, “that’s not strictly true,” just at the moment when I most needed a little room to maneuver with the plot. With Francis, whom I think of as FB and not as the real London bon vivant, I’ve tried to be true to his personality and talents and accurate about his intimates (although except for Nan, I’ve changed their names). But I’ve felt free within the parameters of his life- he was, for example, a real Air Raid Preparedness warden during the Blitz– to invent quite wild episodes with truly fictional characters. Similarly, FB really did go to France shortly after the war ended, and he really did go with both his lover of the moment and Nan. That’s actually probably weird enough. I think we can assume that he never got involved, as he does in the new novel, with professional bicycle racers and French gangsters, although since he was acquainted with the notorious Kray Brothers in London, I think I can claim that at least he brought the gangsters on himself. That’s what I tell myself, anyway, if I feel twinges of guilt for borrowing his life and personality for entertainment. There is something dodgy about mixing fact and fiction, especially with modern characters, and I feel that. But the Muse has her own imperatives and I’ve found it unwise to reject anything that she insists. And then, a little guilt is probably a wholesome thing for any writer of that genre of violence, guilt, and retribution, the mystery novel. 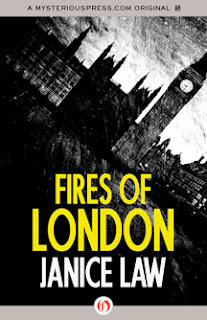 Besides the Bacon novels, Janice Law is the author of the Anna Peters series of mysteries and numerous stand alone novels and short stories. Janice, I feel your pain about fiddling with the facts. I just keep telling myself, 'it's fiction, it's fiction' and write lots of footnotes and discussion guides to explain myself .